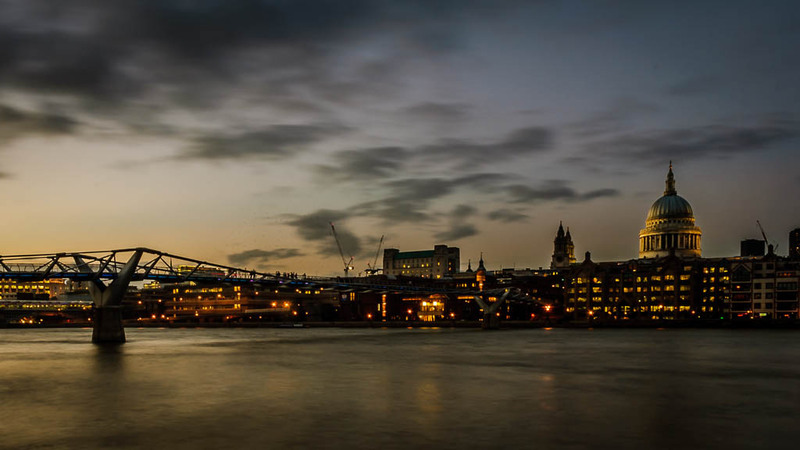 Yet another shot of the London skyline – this is much more “as-shot” than in the last photograph of St.Pauls. This was taken from the south side of the River Thames, just in front of the Globe Theatre – the camera was placed on the river wall as I had no tripod with me – camera strap folded under the lens to adjust the angle – remote release used to fire the shutter. Used a 7.1s exposure, so the water is starting to go smooth – most of the people on the bridge have disappeared – you can make out a few near the centre that must have been standing still – An aperture of f/20 to keep everything in focus. Post processing in Lightroom 5 – a gradient to enhance the sky and the usual lift to the shadows, drop to the highlights and small amount of sharpening. The shot has been cropped to straighten the horizon and remove a section of wall appearing in the corner of the shot.